Despite the best efforts of Jay Sekulow and Steve Gill, it seems Tennessee’s 7th grade social studies standards will still include learning about Islam in the world religion portion of the course. In total, the department’s social studies review team has cut down the number of 7th grade standards, where Islam is taught, from 75 to 67. Hundreds of seventh grade students all across Tennessee converting to Islam after their world history class. It’s happening everywhere. In rural and urban communities. It’s happening because Tennessee teachers are not just teaching world religions, they are specifically focusing on Islam and indoctrinating our children. They must be, with so many conversions happening every single week. Actually, so far, no one has reported a single conversion of any student to Islam after taking a seventh grade history class. Despite the lack of any actual problem, Commissioner of Education Candice McQueen called for an early review of the state’s social studies standards. And, State Board of Education Chair Fielding Rolston punted on the issue. That’s what prompted the changes noted in the Tennessean story cited above. The good news is the standards (as proposed) leave the teaching of Islam as part of a broader curriculum on world religions largely intact. It’s not clear (yet) if Sekulow and Gill will find a new way to gin up fear and pad their wealth as the state enters a comment period for the proposed revisions. The comment period for the standards has been extended to December 15th. Those wishing to review the standards and offer feedback can do so here. State Board of Education Chair Fielding Rolston wrote last week about Tennessee’s social studies standards in light of a “controversy” ginned up by the ACLJ and latched onto by state legislators like state Representative Andy Holt and state Senator Dolores Gresham. What’s the problem? 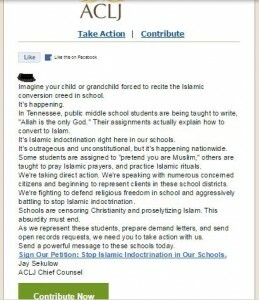 It seems teachers across Tennessee are indoctrinating their students with Islam. Not really, of course. And Rolston goes into some detail about the Tennessee social studies standards, the process for creating them, and the upcoming review of those standards. The review process invites feedback from any citizen and includes Tennessee educators. Local districts determine the curriculum and instruction, adapting what classroom instruction looks like for the students and teachers. There are no State Board of Education requirements regarding the length of time to be devoted to any topic or guidelines on how that topic is taught in the classroom. It is always a local decision how long a particular topic is covered in the classroom and the textbooks and curriculum employed. These statements, while accurately describing the process, also left a door open, and the ACLJ walked right through. Now, local school boards are responding to broad, expensive to fulfill open records requests. Legal responses will be required. Rolston suggests that while the state’s standards should be rigorous, a local district can spend less time on topics that may be the subject of the controversy of the day. Tennessee’s social studies teachers might have appreciated a more vigorous defense. 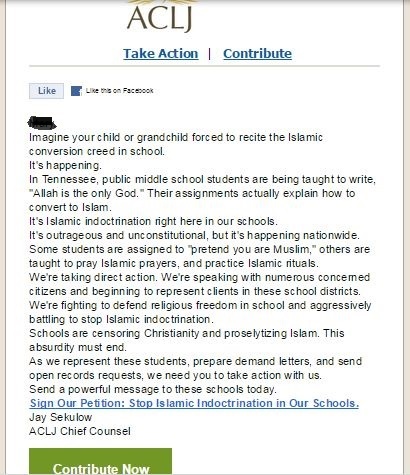 Last week, I reported on Jay Sekulow and the ACLJ’s attempt to profit off of fear of imagined Islamic indoctrination in Tennessee schools. Rather than provide concrete examples of such indoctrination or respond to facts about long-standing state standards, Sekulow and his bunch of so-called religious liberty defenders are continuing the fight — the fight to get donations by way of stirring up fear. The blatantly unconstitutional promotion of Islam in schools has garnered substantial national attention forcing the Tennessee State Board of Education to review the standards earlier than planned. In response to questions and concerns we’ve received from parents in Tennessee, we have sent over 146 “open records” requests to school superintendents—one request to every school district in Tennessee. The ACLJ is requesting the information under the Tennessee Open Records Act. We are asking for information on exactly what students are learning about Islam and other world religions, how students are being taught this information, and what resources teachers are using. We want to get to the bottom of this indoctrination. Where is it coming from and why is it happening? With all this supposed indoctrination going on, where’s the evidence that students have converted to Islam? And then, do they convert to Buddhism later on in the semester when that subject is taught? And now, this question: Should students only learn about Western Civilization and not the cultures with which it intersected? Finally, with all the evidence of indoctrination that ACLJ surely expects to find in their review of documents from local districts, one wonders where all these Islamic indoctrinating Tennessee teachers are coming from and why they chose our state for their conversion experiment? Have you heard about it? Hundreds of seventh grade students all across Tennessee converting to Islam after their world history class. It’s happening everywhere. In rural and urban communities. It’s happening because Tennessee teachers are not just teaching world religions, they are specifically focusing on Islam and indoctrinating our children. They must be, with so many conversions happening every single week. Sekulow surely knows that the ideas espoused in his email are preposterous, but he persists. Likely because he knows ginning up this kind of fear is rather profitable. This report from 2011 details just how profitable his enterprises are. While fear-mongering for cash is nothing new, it’s dangerous when it impacts the teaching and learning going on in Tennessee classrooms. In response to concerns magnified by Sekulow, the Chair of the Senate Education Committee, Dolores Gresham, sent a letter asking the Commissioner of Education to ensure Tennessee teachers aren’t indoctrinating kids with Muslim teachings. Interestingly, Sekulow and Gresham aren’t concerned about indoctrination with other world religions taught over the course of the history curriculum. And so far, they haven’t expressed concern about other ideas Tennessee’s teachers may be planting in the unsuspecting heads of our state’s schoolchildren. “In response to questions we have received from the field, we wanted to share clarifying and factual information on the state’s social studies standards, specifically how the standards address religion. We hope that the information below will help you respond to any questions that may arise from parents or community members. Major religions, including Christianity, Judaism, Buddhism, Hinduism, Confucianism, and Shinto, are covered throughout the courses mentioned above. Although these religions will be taught at some point in these three courses, the focus on each religion will depend on the context and influence of the time period. The attached document titled “Standards” shows the standards covering religion for the sixth- and seventh-grade courses. As you can see in the attached document, Christianity and Judaism are emphasized in the sixth-grade course while the Islamic World is covered in the seventh-grade course. The State Board of Education adopted the current social studies standards in July 2013. The standards were developed by a committee of Tennessee teachers and were available for the public and all Tennessee educators to review and provide feedback. Standards are academic expectations that define what students should know and be able to do at each grade level. Because districts know their students and communities best, curriculum and instruction are local decisions made by the district, schools, and teachers. There is no state required length of time to be devoted to any topic – that is a local decision; however, the department hopes to share a sample pacing guide soon to give to teachers as an example of how much time should be devoted to any one topic. All textbooks and supplemental materials used to teach these standards are determined at the local level. Additionally, textbooks are not prescriptive of a course’s content and sequence. For example, many people have referenced the seventh-grade textbook, Discovering our Past. While it appears that some seventh-grade teachers are covering Islam longer than Christianity, it’s important to note, that the last chapter of the sixth-grade textbook covers the rise of Christianity extensively. That chapter is repeated at the beginning of the seventh-grade textbook. The textbook commission was recently reconstituted and the new process for textbook adoption provides more opportunity for public input. Members of the public can review books/materials by contacting their local board of education, visiting the state textbook collection site at Middle Tennessee State University (MTSU), and/or viewing the materials posted on the department’s website. Comments can be submitted directly to the department or members of the public can request to speak before the Textbook Commission. All public comments will be posted on the department’s website. Additionally, the bond requirement for textbook publishers was lowered, meaning smaller publishers will now have more opportunity to bid in Tennessee. The State Board of Education annually adopts an approved textbook list, however, districts may request a waiver to use a book not included on the state approved list. A social studies field test was administered in the 2014-15 school year. Only a very small number of questions were on this topic. The field test was not used for accountability purposes, but was instead a test to collect information on a wide range of questions to ensure that potential questions are fully vetted and that the operational test uses appropriate questions to assess students learning. Based primarily on the results from the field test and feedback from educators and stakeholders, we have made the decision to review the social studies standards earlier than the traditional six-year cycle. Per Public Chapter 423, passed in 2015, the social studies standards review will go through a similar process our math and ELA standards are currently undergoing beginning in January of 2016. This process requires the State Board of Education to post the current standards to a standards review website to allow the public to review and offer feedback. Following the public online review, educator advisory teams will use their expertise and the public comments to revise the standards. The revised standards will then be reviewed by a Standards Recommendation Committee (SRC). As laid out by the General Assembly in Public Chapter 423, the SRC committee members are appointed by the Governor, Lt. Governor and Speaker of the House. The SRC will then recommend the revised standards to the State Board of Education. Following this recommendation, there will be additional opportunity for stakeholder feedback before the State Board issues final approval. Despite the World History curriculum including learning about Islam and other world religions for years and despite the lack of any affirmative evidence of indoctrination and certainly no evidence of any child converting to Islam as a result of reading about it in a 7th grade textbook, Sekulow presses on. His bank account depends on it. The facts aren’t getting in the way of Dolores Gresham scoring political points, either. Now, we can expect to see pressure put on those reviewing the state standards to remove or reduce any discussion of Islam and pressure put on teachers at schools to avoid discussion of the topic or its historical significance. Legislators are also promising legislative action on the social studies curriculum — because what we really need is the Tennessee General Assembly designing curriculum for our schools. In all of the storm over a curriculum that has been on the books for years, I go back to one central question: With all this supposed indoctrination going on, where’s the evidence that students have converted to Islam? And then, do they convert to Buddhism late on in the semester when that subject is taught? I don’t suspect Sekulow or Gresham will be answering that question anytime soon.